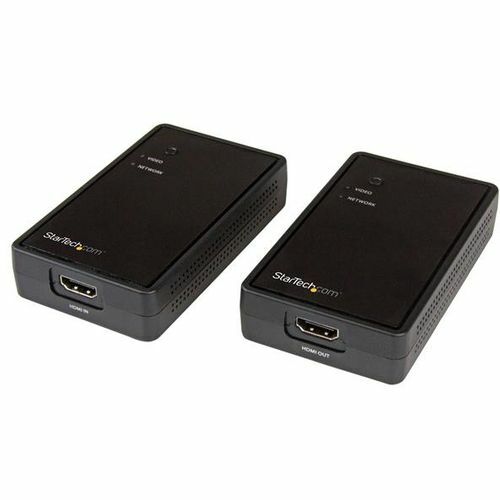 This HDMI over wireless extender lets you transmit your audio / video signal from an HDMI source to a remote display located up to 165 ft (50m) away. The extender kit uses Wi-Fi to transmit an uncompressed, high-definition 1080p HDMI signal, as well as an IR signal for controlling your source device remotely. With wireless video extension, you can extend or mirror your laptop computer to share documents or multimedia content (including music, video, and pictures) in full HD, perfect for sharing ideas with your colleagues on a boardroom projector or tradeshow display. Cut the cord and the installation work The HDMI over wireless extender offers a practical alternative to traditional copper video cabling, which saves your budget by avoiding the cost of installing an expensive wiring infrastructure. This bundled kit includes both the transmitter and receiver, saving you the hassle and expense of buying multiple devices to accomplish one task. Wireless video with no compromises The extender is great for digital signage applications because it lets you install your display wherever you want, unlike wired solutions that force you to compromise on the location of your display based on the available cabling. Easy installation and operation This wireless video extender is very easy to install and use. With simple plug-and-play installation, setup is as easy as connecting the video cables and turning on the extender. The wireless video extender is a pure hardware solution that doesnt require any software or drivers, saving you time by avoiding complicated software installation and configuration. With hassle-free operation you dont need to be an A/V technician to use this extender, which makes it a great solution for commercial markets such as retail storefronts and lobbies, as well as healthcare and education facilities. The ST121WHD2 is backed by a 2-year StarTech.com warranty and free lifetime technical support.